Getting kids was one of the best things that ever happened in my life. People do change, inevitably, and so does the way you spend your free time. In my case, spending time in nature, near a lake or a river is our favorite kind of leisure and open-air entertainment. That’s when I got interested in researching the market for the best inflatable boats. 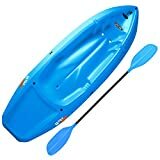 We decided to get one so that we can enjoy fishing from the middle of the lake, as well as a relaxed day on the water. Owning an inflatable boat really changed my life. My whole family started enjoying our time together more than before. Some of the striking benefits of owning an inflatable boat include more fun with your family and friends, lots of space for your equipment, safety, as well as a convenient boat that does not consume much space. I highly recommend you learning more about inflatable boats before you get one, as there are different types of high-quality inflatable boats on the market that are suitable for different needs. We want to take you to the exciting journey of finding the top-rated inflatable boats for you. So, let’s get started! First, let’s define what an inflatable boat is. This is a type of boat that is lightweight and made from a durable, usually vinyl material, constructed from a floor and flexible, air-inflated, pressurized tubes - sides. Inflatable boats are used for fishing, cruising and other on-water activities. Their greatest benefits include the facts that they can be easily deflated and stored and that they are lightweight. As most people don’t go camping and fishing each weekend, storing a hard-shell boat can be tricky. This is why the majority of non-professionals opt for inflatable boats. In addition, these amazing boats are used for various safety and rescue operations. Their flexibility, as well as high safety features, allows various applications in different environments and conditions. We recommend you to stay with us and learn how you can choose the best inflatable boat for your individual needs, how you can recognize the best inflatable raft for fishing, or boating. Let’s see how we picked the best models! 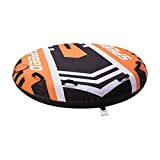 As I am passionate about different kinds of sports, mainly open-air sports that allow spending lots of time in nature, such as hunting and fishing, getting a quality inflatable boat was a logical decision for me and my family. However, picking the very best model was not easy. The good thing is, I learned a lot about boats while struggling to find information on the Internet prior to my purchase. Now, I can say I know quite a bit about inflatable boats. My interest in these types of boats did not cease after getting one. On the contrary, I became more interested in the way they work and the mechanisms and constructions behind the best inflatable boats. This is why I decided to share my experience with you. However, I had to rely on community-based reviews as well. Finally, I consulted experts on boats and they provided invaluable insights into some things I didn’t know. This is how we prepared a comprehensive list of criteria that helped us narrow down the choices. This approach also helped us make a list of things to consider when buying inflatable boats. We categorized them according to different purposes and capacities, so you will be able to find the best inflatable boat for fishing, cheap inflatable boats, lightweight inflatable boat models, point out the advantages and disadvantages of different good inflatable boats, as well as make an objective inflatable boats comparison. Even though your final choice will most probably be based on the type of water and your level of experience, as well as a balance between material, capacity, and price, there are some common factors that all quality inflatable boats must have. We have made a list of 14 things to think of before making your final decision. Those include the type of the boat, frequency of use, construction material and decking material, design, durability, ease of set up, comfort, maintenance, stability and safety, capacity, oars and pump, price/budget, as well as the pros and cons of catarafts vs. regular boats and air decks vs. rigid aluminum slats. Let’s learn more about each of these points. There are five basic types of inflatable boats. We want to point out that it is very important to get to know each of them, with their pros and cons, as this will help you choose the best model. Those five types include rafts, dinghy, kayak, pontoon, and float tube inflatable boats. Let’s learn more about each of these types! Rafts are similar to kayaks and dinghies at first sight, but we must emphasize that there are several very important differences. First of all, rafts have a different shape. Moreover, their configuration is different. Rafts have a circular air-filled tube. The tube surrounds the floor and the boat seats. Rafts have an open design. The key reasons for the high raft popularity are a range of prices, i.e. suitability for different budgets, and versatility. This type of inflatable boats is peculiar for its shape. 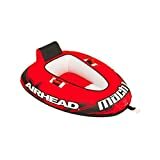 If you are looking for the best small inflatable dinghy, you can easily recognize it as soon as you see the U-shaped air bladders. The bladders are not connected at the rear part of the dinghy boat. Why did the engineers decide to shape the dinghy boat in this way? Such a construction increases the boat’s stability and enables easier and better control over the boat to the user. Another benefit of buying a dinghy boat is compactness and ease of transportation/storage. Inflatable kayaks are recognizable for their narrow and long body. This allows for good hydrodynamics. However, this feature has its downsides as well. It is not always easy to install a motor. Those models that are not compatible with any kind of motors will require paddling. Their advantages include easy control, excellence in long distance travels, suitability for fishing, and attractive design. Pontoon boats are often the very best solution for different categories of users. There are two key types of pontoon boats: framed and frameless type. The greatest advantage of these boats is the fact that you can easily install a motor. They provide very good stability. This is important for fishing. The drawback of this type of inflatable boats includes the issue of storage. Float tube inflatable boats are the smallest type of these boats. As a result, they are very affordable. You will have to use your feet, as these boats are not big enough for a motor. If you love contact with water, we recommend the float tube boats, as the chances that you will get wet are very high. One of the advantages is very easy and good maneuvering, even in small spaces. However, don’t pick this boat if you don’t like fishing from a seated position. How often do you want to use your boat? Are you a regular fisher? Do you go camping and cruising on a lake every weekend? Will you use the boat only for a few days during the summer? You should make your decision based on the frequency of use. If you will use it a lot, invest more money and get the best model you can. On the other hand, if you plan to use the boat occasionally or rarely, you don’t have to spend a fortune. Make sure that its safety features are good enough and get a middle price range boat according to your needs. If you are interested in inflatable boats and are making research, you will notice that the most common inflatable boat material is PVC. However, there are different types of PVC that provide drastically different boat features. This mainly refers to longevity and safety. If you want a high-end product with state-of-the-art material, we recommend Hypalon. You can also consider aluminum for the rigid parts of the boat. Some quality models have aluminum floors or reinforcements. Also, you should opt for aluminum for oars. When it comes to decking material and design, there are several options: inflatable and non-inflatable design, as well as aluminum or some other, less suitable material. We recommend a non-inflatable design and aluminum. This is the pricier option, but you will get a quality product that is durable and convenient. The only disadvantage of the non-inflatable models is less comfortable. The durability of the boat is obviously one of the most important factors playing a significant role in user satisfaction. Everyone wants a durable boat. There is always a puncture risk. However, quality material and construction will diminish that risk. Keep in mind that better materials imply higher prices. However, we do recommend investing a bit more, as inflatable boats are not things you will be buying often. Also, quality material means that you will spend less money on repairs. This is another important factor, as people usually want a boat whose assembly does not take much time. Also, the setup process should not require more than one person. Tool-free assembly is another important feature. Similarly, ease of maintenance is sought after when buying inflatable boats. You must know that all inflatable boats do require maintenance. We described key maintenance rules later in this article. However, you should also know that picking quality material will diminish the maintenance requirements of the boat. Comfort is another important aspect, as you will probably spend a lot of time in your inflatable boat, regardless of whether you are fishing or cruising. Things you must pay attention to include legroom, seats, and inflatable cushions. You have probably noticed that all serious inflatable boats review sites pay lots of attention to comfort. You should also not underestimate it when choosing your inflatable rowboat or inflatable fishing boats. As you already know, the stability of the boat and maximum safety of all passengers are the two most important features of the best inflatable boats. Construction of the boat plays a key role in ensuring both stability and safety. We are proud to say that modern technology managed to provide state-of-the-art solutions and inflatable boats today are safe, comfortable, and stable. The users must pay attention to the boat PSI. Inflating the boat correctly and reaching the optimum PSI leads to a stable boat. Using a pressure gauge equipped pump will help you control the PSI. It is true that inflatable boats can take less weight than the regular boats. However, new-age materials and advanced boat constructions increased this limit to even 2000 lbs.! However, you must not forget to count the weight of all the equipment and load you are carrying on your boat as well. 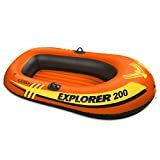 You can find the very best inflatable raft or the best inflatable boats that suit your capacity needs in general based on a simple calculation by adding 20% to your weight and weight of the people who will be in the boat with you, as well as the weight of all equipment and cargo you plan to take on board. This will give you the perfect capacity of the most suitable inflatable boat for your needs. In this way, you can be sure you will not buy inflatable boats that don’t suit your requirements. Here we come to the well-known dilemma of choosing catarafts or regular inflatable boats. Regular boats have many air chambers, while a cataraft has only two. Rafts are more popular and easier to find. They’re also stronger. If you wonder which one of these two types can take more load, a cataraft is a winner. This is important if you opt for a motor-operated boat. Moreover, catarafts have a rigid construction. Inflatable boats are more lightweight. Cataraft is more expensive. The traditional inflatable boat provides more space. Let’s compare the features of the air deck and rigid aluminum slats. First of all, air deck requires less assembling time than the floorboard boat, but the slatted deck is the absolute winner in this category. Similarly, the slatted deck is the most lightweight model of them all. It has a flat bottom, while the air deck has a V-shape bottom. On the other hand, the slatted deck will have a lower performance than an air deck. It also has less strength, while the air deck has relatively good strength. The slatted deck does not require special maintenance, while the air deck needs some special care. However, remember that the air deck models are more comfortable than the slatted deck models. In the end, the air deck is more expensive than the slatted deck boat. The pump is an inevitable part of the equipment when buying an inflatable boat. Some manufacturers provide a hand pump, others include a foot pump, while some don’t provide the pump at all. The best models come with the automatic pump that will save you time and effort. Some pumps come with a pressure monitor. This is very important for the correct PSI of the boat. Similarly, oars are extremely important for the proper functioning of your boat. Quality oars are usually made from aluminum. There are several factors affecting the inflatable boat price. Those include material quality, ease of maintenance, anti-puncture protection, and warranty, as well as the brand reputation. When it comes to the material, the story is very simple. PVC is cheaper and Hypalon is more expensive. There are different types of PVC as well. It also dictates the price. Simply put, the more you invest, the better the inflatable boat you get. Picking the best boat was not an easy task. That’s why we picked top 10 inflatable boats in different categories. First, we analyzed their basic value factors, presented in the “Things to consider” section. Then, we were able to decide which specific product is the best for different needs. Therefore, you can benefit from reading our comprehensive top 10 review. Why wait? Let’s meet some of the best rated inflatable boats on the market! This inflatable boat model by Intex, one of the best inflatable boat brands, is, according to our analysis, the very best model for five persons. It is sturdy and reliable. Let’s talk about its construction first. The boat has an inflatable I-beam floor. It provides rigidity, increases boat safety, but also increases your level of comfort. If you have had some inflatable boats before, you definitely know that the worst feeling, especially for beginners, is an unstable floor that feels too soft. You won’t have such problems with this model by Intex. There is a front, middle, and rear “excursion” seat. Moreover, we liked the fact that its structure is composed of three air chambers. In addition, there is another chamber in the hull. This provides extra buoyancy. When it comes to filling and deflating, there is a Boston valve on two chambers. You can quickly set up and deflate the boat, without special effort. When it comes to physical characteristics of this 5-person capacity boat, its inflated state dimensions measure 10ft 4in x 5ft 5in x 1ft 5in. It has 54-inch quality aluminum oars. The all-around grab line is super convenient. The boat also has 2 oarlocks, one on each side of the boat. The oar locks are welded. This model is versatile, as our community-based reviews show it is perfect for fishing, cruising, as well as other activities on the water. This boat is made from super-durable vinyl material. It is a tough, rigid, convenient, durable, and safe boat. This model is very comfortable. The boat is approved by the US Coast Guard. It is good for fishing, cruising, and camping. This boat is shipped only within the USA and to selected countries outside of it. It comes with a hand pump, not the battery-operated pump. 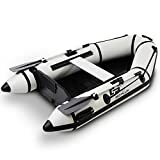 This lightweight, durable, and compact inflatable boat is the best choice for fishing, camping, as well as cruising trips for five people. Its key advantages include safety, durable materials, and extreme comfort. We picked this product as top of the list for excellent construction, lots of space, and low weight. We recommend you to choose this model if you want a ready-to-go, quick set-up, 3-air chamber, convenient and durable boat. If you are looking for the perfect boat for four people that will ensure excellent fun on your boating, fishing, and cruising adventure, Intex, a reputable inflatable boat and gear brand, has the best model for you. It is the Seahawk 4 model that we will now present you. First of all, this is one of the top inflatable boats on the market. It is made from the highest quality, heavy duty PVC. This material is resistant to scratches and ensures comfort and durability. In addition, it is puncture resistant. You will definitely use this inflatable boat for many years. The manufacturer really thought of the comfort of the users of this boat, in all possible segments. There are inflatable cushions for extra comfort. This model is a 3-air chamber boat. There is also an additional chamber located inside the main hull. This provides extra safety. While we were testing the boat, we noticed that it has an excellent all-around grab line. This is a very convenient feature. Moreover, this model comes with oar locks and holders. It measures 138x57x19 inches. Its maximum weight capacity measures 1050 lbs. What do you get in the package? You get the boat, a repair patch kit, welded oar locks and holders, a hand pump, as well as the U.S. Coast Guard I.D.The aluminum oars, measure 48 inches, each. This boat is perfect for 4 people. It has a very good, maximum capacity of 1050 lbs. It is a three-chamber boat model. This inflatable boat is made from high-quality PVC that is puncture-resistant. It is a safe and durable model. Some users complain about the floor that is too soft. If you are looking for the perfect model for four people, with very good lbs. capacity measuring 1050 lbs., you have just found your perfect match. Intex Seahawk 4 is made from a very durable material that is puncture-resistant and provides comfort to the users. In addition, it is a high-quality 3-chamber model. You will get a rich package, with the repair kit and a pump. In addition, this model is made by a reputable brand that is well-known in the boating world. If you are looking for a 3-person inflatable boat, we believe that HydroForce Voyager 1000 3-person raft is the best choice. To be more precise, this model is suitable for two adults and one child, or a person that is not heavy. Total weight capacity is 594 lbs. This is a very strong, durable model. The key peculiarity of its construction is the 3-ply heavy-duty PVC structure. This is a very good structure for the boat, especially if you take into consideration that the manufacturer states that this model is UV-rays resistant. The material won’t degrade over time. Similarly, it is resistant to abrasion pollutants. While testing this model, we liked the integrated fishing rod holders. Therefore, we highly recommend this inflatable boat for fishing. You will also like the safety-grab ropes. In addition, it has inflatable cushions and a storage bag. We also liked the content of the package. You will get a hand air pump, a storage bag, and a pair of 60-inch aluminum oars. We liked the fact that they are omnidirectional. The motor of this attractive model is up to 1.4hp. Total dimensions measure 115" x 50" x 18". This is a lightweight and durable model. It is perfect for fishing. It has a strong, durable 3-ply PVC-nylon-PVC structure. 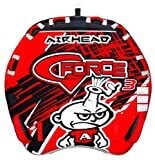 It is pollution and abrasion-resistant. The product can be used with a manual pump only. If you want to have a boat that can take three people and has 594 lbs. capacity, a strong 3-ply structure and is UV-resistant, we strongly recommend you to consider the HydroForce Voyager 1000 3-person raft boat. This model is perfect for lake exploration and fishing. It comes with a pump, a storage bag, and oars. You will also appreciate the integrated fishing ropes. Do you want a boat for two persons? Are fold-down seats your preference? Do you want to benefit from large storage (20 pockets and 2 drink holders) perfect for camping and all-day cruising? Classic Accessories Colorado Inflatable Pontoon Boat is the best choice for you. Let’s learn more about this amazing boat that ranks #4 on our list. This model has rod holders that can be mounted in three different positions. In addition, there is a two-position motor mount. It is suitable for trolling. There are also 3 oar-lock positions. Therefore, this is one of the most versatile and flexible two-person capacity inflatable boats on the market. Moreover, we really liked the boat design. You can pick from two colors: black or sage green. Both of them are very attractive and perfectly suit the overall boat design. Moreover, the motor mount is weatherproof. This boat measures 108 inches in length, 56 inches in width and 26 inches in height measured to the top of the seat. It is 71.5 lbs. heavy. It comes with 7-inch 2-piece aluminum oars. What does the manufacturer offer? You get a 1-year warranty, a detachable micro-slit foam fly patch, as well as non-corroding oarlocks. The maximum capacity of this boat is 400 lbs. It’s 9-inch, heavy-duty pontoons are made from excellent material. Namely, the manufacturer used high-end anti-abrasion and wear-proof PVC. It is good, even for the shallowest waters. High storage capacity inflatable boat is perfect for camping and cruising. The weather-proof motor mount is very convenient. The boat has a sturdy 2-position motor mount. There are 3 oar-lock positions. All seats and footrests are adjustable. The manufacturer states that this product can expose you to TDI, a chemical denoted as unsafe (by the state of California). It comes without the air pump. The greatest advantage of this 2-person capacity inflatable boat is a very large storage capacity. In addition, we liked the fact that the heavy-duty pontoons are made from abrasion-resistant PVC bottom. Therefore, this is a durable inflatable boat built according to all safety standards. In addition, it has non-slip footrests and adjustable seats. The footrests are also highly adjustable. If you are looking for a 400-lbs. Capacity boat good for two people, this is the best model for you. Are you a dynamic person/family/group of friends who love to travel and not to stick to one place for fishing, cruising or camping? Classic Accessories Colorado XT Inflatable Pontoon Boat is the best choice for you. Let’s learn more about this exceptional model. First of all, gear bags are removable. As a result, you can benefit from the highly customizable storage space. There are 20 pockets in total, as well as 2 insulated drink holders. Therefore, you will quickly realize that this model is very good for camping and cruising. Moreover, there is a powder-coated steel tube frame, as well as a rugged, 2-piece aluminum oar set, measuring 7-inches each (two pieces). Additionally, the rod holder can be mounted in 6 positions. The anchor system has a fillable mesh bag. In general, this model is easy to set up, use, and, most noteworthy, easy to transport. Why did we pick this model as the very best one for easy transportation? Because of its transport wheels! There are not many models in the market with transport wheels. These allow very easy access and moving the boat effortlessly over different surfaces. In addition, this model weighs 68 lbs. The pontoons measure 9 inches. You can choose from two colors combinations: sage-grey and pumpkin-grey. The manufacturer provides a 2-year limited warranty for this 400-lbs. capacity inflatable boat. You must be very careful to avoid punctures. If you are not a stationary nature, river, and lake explorer, or if you don’t like cruising and fishing on the same location all the time, you need to buy the Classic Accessories Colorado XT Inflatable Pontoon Boat. This is the best boat on the market for easy transportation. It comes with wheels that allow easy movement of this boat. It has 400-lbs. capacity and 9-foot pontoons. It weighs 68 lbs. and a 2-year warranty. We highly recommend this product. Do you want an extra-large inflatable boat? What if we tell you that one of the models that amazed us with its design and performance has a 1675-lbs. capacity? Yes, that’s correct! It can take 6 adults! This amazing boat weighs 180 pounds. It has a 12.5 mm thick aluminum floor and a 1.2 mm high-quality PVC main tube. The outboard motor material is the marine plywood transom. You will like the fact that the bottom layer is doubled. It provides extra safety and rigidity. You will feel very stable, safe, and protected in this boat. In addition, there are three individual air chambers. This is very important, as some critical situations, such as punctures or deflation of one chamber will not jeopardize you. At the same time, the inflation/deflation process is very simple and quick. Moreover, there is a deep V-keel and rub-strake protection. The oarlock is integrated. Let’s talk about the material itself a little bit more. The 2000 Denier PVC fabric is much better than the 1100 Denier PVC fabric. It is much more durable and puncture-resistant. Therefore, this boat model is sturdy and will definitely last and serve you many years to come. You will also get a rich package with the product. Namely, the package includes the aluminum floor, oars, a foot pump, a repair kit, and a carrying bag. Now, let’s see the full list of the product specifications. Heavy duty PVC material provides extra durability and sturdiness. The boat has a quality, 12.5-mm thick aluminum floor. It has excellent, 6-people capacity. It has a total of 1675-lbs. capacity, which is the best offer on the market. If you want to find an inflatable boat with a very good capacity – up to 6 adult people, Bris 1675-lbs. capacity model is the best choice for you. The greatest advantage of this excellent boat is high-quality PVC material (2000 Denier type), as well as the aluminum floor. In addition, it has 3 chambers, comes with the oars and a pump. You will enjoy using this 6-people capacity boat for a long time. We would like to start this review with the key peculiarities of this model. The first thing we noticed was that the boat has an inflatable floor and a movable seat. It is made from heavy-duty vinyl. The seams are electronically welded. In addition, this model has wraparound grab lines and 2-rod holders. There are also several drink holders. When it comes to boat capacity, it is good for 3 people. It measures 96 inches (length) and 54 inches (width). Moreover, we must emphasize that this model has four drain plugs and a ditty bag. It is a lightweight, portable boat mostly chosen by users who want to use it for lakes and still water explorations. What else can you use this boat for? User reviews say that this model is excellent for fishing adventures. It is a portable, lightweight model that is very popular both among beginners and experienced users. The best thing is, this model is compatible with the airhead trolling motor transom. Versatility, compatibility, and flexibility are among the most important features when buying an inflatable boat. This boat has four drain plugs and a battery storage bag. It is made from heavy-duty K80 PVC material that is weather-resistant and very durable. Now, we will show you the full specs list for this amazing model. This is a lightweight and portable model. It has a three-person capacity. This model has four drain plugs. It is made from heavy gauge K80 PVC. It is a durable model suitable for fishing and cruising. This model is not eligible for international shipping. If you want to enjoy a 3-people inflatable boat, Airhead Angler Bay Inflatable Boat is the perfect model. This durable boat is made from K80 PVC material and it is suitable both for cruising on slow rivers and lakes and fishing. In addition, this model has 4 drain plugs, 2-rod holders, and very comfortable seats. The users state that it is a lightweight and portable model that provides excellent comfort and safety. Here is another excellent model by Intex. Intex Explorer 200 is a very good choice if you are looking for a 2-person inflatable boat. First of all, we want to tell you what it is designed for. This boat can be used on calm waters, lakes or pools. It has 2 air chambers. Also, you will get 2 oars. This boat is comfortable, as it has an inflatable floor. This provides both rigidity, increases your safety, and ensures comfort. Moreover, this model has a 210-pound capacity and the following dimensions: 73 x 16 x 37 inches. What do you get in the kit? You will get the air pump, a mini model and the repair patch kit. To summarize this review, we want to point out that we liked the safe construction and comfort of this boat. This is why the manufacturer emphasized that this model is suitable for pool activities. Trust us, this product will be your best friend on your lazy summer chill out days. This product is one of the best models for two people. This inflatable boat is made from high-quality PVC. It is a durable and weather-resistant model. It is the best product for pool leisure and still waters. This model has a rather small weight capacity. If a 2-people boat made from a quality 13-gauge PVC is what you are looking for, look no more. 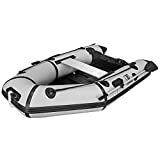 This model is a durable, safe, and attractive inflatable boat with two air chambers, a grab rope, an inflatable floor, providing extra comfort and rigidity. You will get welded oar locks, a repair patch, an air pump, and a U.S. Coast Guard ID. The dimensions of the boat are 73 by 16 by 37 inches. The boat capacity is 210 pounds. The peculiarity of this model is the molecular structure of its material. It is made from a very strong PVC that ensures durability and convenience. Moreover, this model is abrasion, UV, and impact-resistant. This is one of the key reasons why so many people choose this model. In addition, it has four Boston valves, it is easy to inflate and deflate it, and the keel is inflatable as well This is why it is easy to handle and control this boat. Also, you will like a durable guard and the grab line. The capacity of this model equals 880 lbs. When this boat is inflated, it measures 129" x 57" x 19". This is a four-people boat. You will get aluminum oars and a high-output pump. Experts say that the material of this boat is very good and provides durability and safety. Also, boat construction consists of three layers. The outer layers are made from PVC, while the inner layer is made from polyester mesh. This model is suitable for fishing and boating. The inflation and deflation processes are easy and don’t require much time, due to the quality valves. You will get a repair kit, a pump, as well as the motor mount fittings, and a battery pouch. This boat is suitable for four people. The accessory package is rich. The structure of this boat is excellent – a 3-ply structure. The bag that comes with the product is too heavy. If you are looking for a quality inflatable raft-type boat suitable for four people, we recommend this model by Intex. It comes with lots of useful accessories, quality oars, and it is made from quality material. Additionally, you will love the fact that this model is UV-resistant and impact-resistant. It is a durable, convenient, and sturdy model. The first thing we liked about this beautiful boat is its design. It will definitely leave you speechless at first sight. Its sleek contours and white color are unique and mesmerizing. This model’s peculiarity origins from its designers. Did you know that this boat was designed by nautical engineers to achieve rear buoyancy and easier use? We loved the touch and feel of this model during our testing. Actually, this is one of the models we enjoyed the most. Moreover, the extended rear pontoons, as well as the transom area lead to a higher max allowed weight capacity limit. This is a 5-people boat, with a max weight capacity of 1158 lbs. We also liked the floor. It is made from aluminum. It is an easy-slide, 24-mm floor. It is a very stable and convenient model. The seats are strong and comfortable. In addition, this boat is easy to clean. Let’s talk a bit more about the construction and technical aspects of the boat. The seams are heat welded. Therefore, this boat is suitable for salt water, fresh water, and extreme weather conditions. The construction material, 1100 denier PVC is not as good as the 2000 denier PVC, but it is a UV, stain, puncture, and oil damage-resistant material. We also liked the package content. You get a removable seat cushion, 2 repair patches, 2 aluminum bench seats, 2 aluminum oars. lock-in holders, a carry and storage bag, a quality foot pump, a one-way drain plug, heavy duty carrying handles, as well as two towing D-rings. This being said, we can say with certainty that this is the best-equipped boat package on the market! We were surprised with the rich content of the accessories that come with the boat itself. This model has an excellent max weight capacity. It can accommodate up to 5 adult people. It is made from a quality PVC material. This boat comes with a very rich set of accessories. Assembly is a bit more time-consuming than that of similar models. This 5-people model has 2 adjustable bench seats. In addition, there are two handles. It is USCG approved. The manufacturer provides a 3-year warranty. If you want a durable boat with amazing design and excellent capacity, this is the right product for you. Finally, the number of accessories that come with this boat is amazing. You will get everything you need for a safe, comfortable, and convenient cruising or fishing. Keeping your inflatable boat in good condition is crucial for safe and enjoyable experiences. Here are some care and maintenance tips recommended by the manufacturers and inflatable boat experts. First of all, you must remember to store the boat in a dry place. Experts agree that this is the crucial thing for keeping your boat highly functional. You definitely want to avoid mildew, rotting, and bad odor. Remember that storing your inflatable boat in a wet environment can damage it, as it weakens the fabric. Also, don’t forget to cover the boat after you store it. This will protect it from dust, moisture, and other negative effects in the storage place, as well as possible contact with animals, depending on your boat storage location. Next, we want to talk about keeping your boat clean. This is extremely important. Why? Dirt will degrade the material consistency of the boat. It will weaken it, as some chemicals can penetrate the material structure. In addition, you definitely don’t want to see ugly stains on boat fabric. You should clean it with a towel used just for your boat. If there are any stains, you should use warm water. Avoid chemicals, as they can penetrate some of the boat materials and damage them. Protecting your boat from UV rays is very important. Some boats come with UV protection. However, lower quality models do not have this type of protection. Such boats will become weak over time. The material may become damaged and brittle. Luckily, there are some affordable and very efficient products that provide UV protection to your boat. You can get them from some manufacturers, from boat gear stores, as well as online. Even though spending a day or two on the water definitely guarantees lots of fun, there are some safety issues we must address. These refer both to the boat choice and behavior before you enter the boat, while you are on the boat, and after you leave the boat, i.e. maintaining the boat itself. Let’s see some of the key safety tips from experienced users, leading inflatable boat manufacturers, and experts. Opting for an inflatable boat is a very good idea. If you have chosen an inflatable boat instead of a hard-shell boat, your safety is already increased. Climbing into the boat from water is much easier. Anchoring and approaching the shore is safer. Low center of gravity and more buoyancy reinforce the inflatable boat safety features. In addition, if you choose an inflatable boat, you can really have your peace of mind, as these models are virtually unsinkable. Quality models have systems which keep the boat inflated even if some of the chambers is punctured. Finally, these types of boats are used by the rescue teams and military services, as one of the safest kinds of vessels. You should find out lots of information about your boat even before the purchase. Similarly, read the User’s Manual from cover to cover in order to learn more about your boat. This is the only way that will guarantee maximum safety. Each manufacturer will definitely list the safety measures in the User’s Manual. In addition, there is a list of limitations and prohibited actions when it comes to inflatable boat use. You must always stick to the person and lbs. maximum allowed capacity of the boat. Similarly, learn more about the boat inflation and weight distribution rules explained in each User’s Manual. This will help you understand the behavior of your boat in different situations and guide you to perform the correct actions in regular and critical situations. You should always have a repair patch kit and tools on board. Also, experts recommend having a manual pump, a map, paddles, as well as a visual distress signal device each time you go cruising with your inflatable boat. In addition, having life vests for each person on the boat is always a very good idea. This is a must if you have kids or people who don’t know how to swim on board. Some boats are suitable only for still waters, while others are versatile and can be used on fast rivers as well. You must always use your boat according to the water type it is intended to be used on. You don’t have to have the official license to use inflatable boats for fishing or cruising. However, education is recommended, mostly when it comes to navigation rules, behavior in heavy traffic zones, etiquette, as well as the right of way rules. Depending on your country, there might be slight differences in these rules, but the general boating rules are equal or similar on the international level. Finally, we can say that owning an inflatable boat is a great pleasure. It will definitely bring you lots of joy, especially if you plan to use it with your friends and family. We have discussed the value factors and tried to give you a detailed, analytical, and a comprehensive guide to choosing the right inflatable boat. We chose the Intex Excursion 5 as the very best inflatable boat on the market. We analyzed all criteria from our value grid and concluded that this model is the winner. Intex Seahawk 4 is the runner up. This 4-people boat has excellent features and amazing performance as well. Don’t forget to focus on your own preferences and needs when analyzing the best inflatable boats. Regardless of the type, you are looking for, be it the best inflatable boat for the ocean, some of the best inflatable boats for fishing or the best inflatable boats with a motor, you can definitely find lots of quality models from different reputable manufacturers.